Government spending refers to money spent by the public sector on the acquisition of goods and provision of services such as education, healthcare, social protectionSocial SecuritySocial Security is a US federal government program that provides social insurance and benefits to people with inadequate or no income. The first Social Security Act was signed into law in 1935 by President Franklin D. Roosevelt. The law underwent several modifications over the years to include several social welfare, and defense. In national income accounting, when the government acquires goods and services for current use to directly satisfy the individual or collective needs and requirements of the community, it is classified as government final consumption spending. In national income accounting, when the government acquires goods and services for future use, it is classified as government investment. They include public consumption and public investment, and transfer payments consisting of income transfers. Public spending enables governments to produce goods and services or purchase goods and services that are needed to fulfill the government’s economic objectivesMonetary PolicyA monetary policy is an economic policy that manages the size and growth rate of the money supply in the economy. It is a powerful tool to regulate the. Over the years, we’ve seen significant changes in the role and size of governments around the world. Public spending increased remarkably in the 20th century, with governments all over the world started spending more resources and funds on education, healthcare, and social protection. At present, the governments of developed countries spend more as a percentage of Gross Domestic Product (GDP)Gross Domestic Product (GDP)Gross domestic product (GDP) is a standard measure of a country’s economic health and an indicator of its standard of living. Also, GDP can help compare the than the governments of developing countries. Also, governments around the world relied upon the private sector to produce and manage a country’s good and services, and public-private partnerships, in particular, became a popular mechanism for governments to finance, design, build, and operate infrastructure projects. In the 2005-10 period alone, the total value of public-private partnerships, designed to increase the spending on public infrastructure projects in low and middle-income countries, more than doubled. To supply goods and services that are not supplied by the private sector such as defense, roads and bridges; merit goods such as hospital and schools, and welfare payments and benefits including unemploymentStructural UnemploymentStructural unemployment is a type of unemployment caused by the discrepancy between the skills possessed by the unemployed population and the jobs available and disability benefits. To achieve improvements in the supply-side of the macro-economy, such as spending on education and training to improve labor productivity. To provide subsidies to industries that may need financial support for either their operation or expansion. The private sector is not able to meet such financial requirements and hence public sector plays a crucial part in lending necessary support. For example, transport infrastructure projects do not attract private finance unless the government provides expenditures for the industry. To help redistribute income and promote social welfare. They are for the short term and include expenditure on wages and raw materials. They are for the long term and do not need to be renewed each year. Also called “social capital,” they include spending on physical assets like roads, bridges, hospital buildings, and equipment. 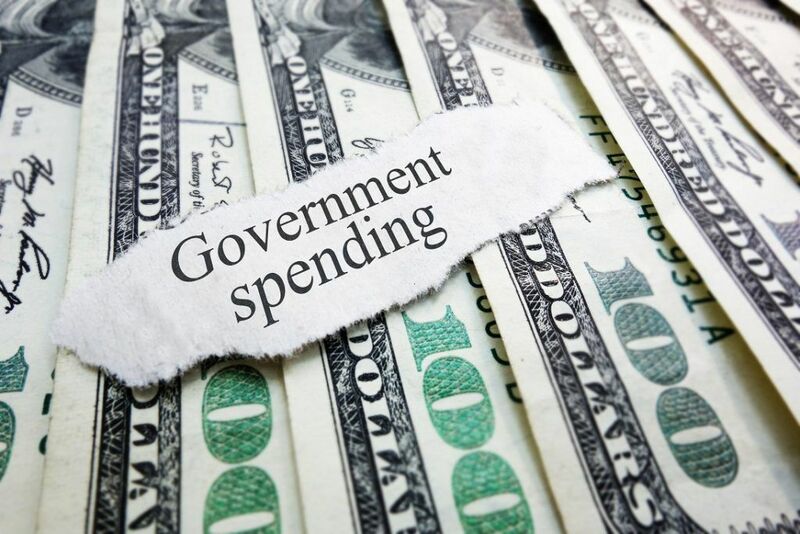 The government mainly gets funds to spend on the economy through revenues it earns. However, when revenue is insufficient to pay for the expenditure, it resolves to borrowing. Borrowing can be short-term/long-term, and it involves selling government bonds/bills. Treasury bills are also issued into the money markets to help raise short-term cash and lasts only 90 days.